At the moment, I'm reading Nigel Slater's 'Toast'. Although he was born in 1958 and is a contemporary of my mother and my uncle; many of his food references could have been picked straight from my own childhood. Brands like Cadburys Smash and Mini Rolls; Birds Custard; Dairylea on Cornish Wafers; and tins of Teatime Selection Biscuits. Like Slater, as a child, I used to pore over my mother's recipe books and dream of eating many of the things on those glossy colour plates. Never the things that were drawn or photographed in black-and-white; just the things in glorious technicolour. Sadly, secondary school cookery (and my mother's assertion that catering was a bad career choice) put paid to any foodie aspirations. Need to practise with the Instagram aperture setting! 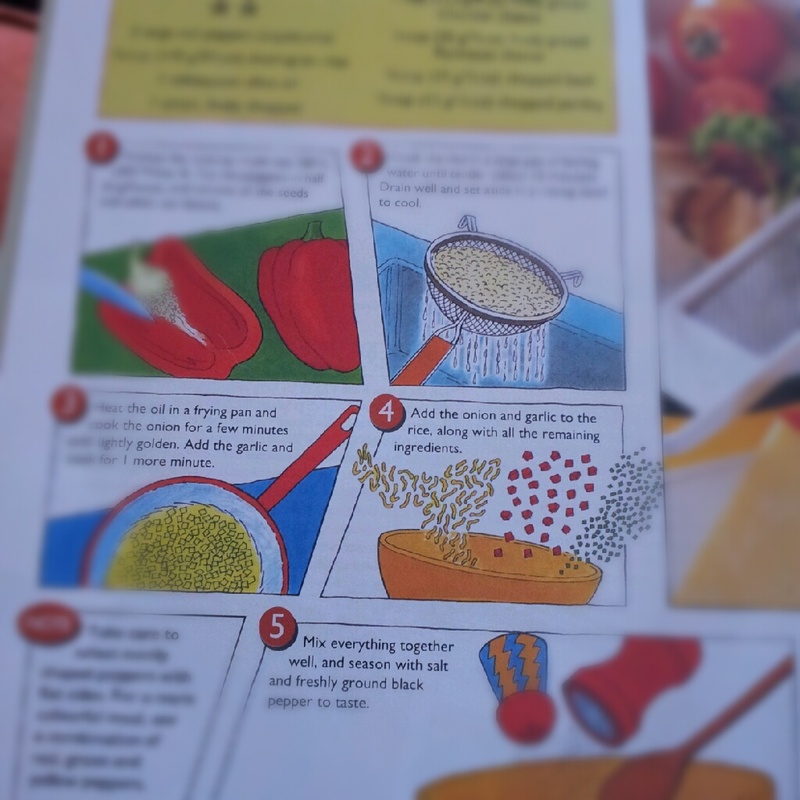 One of my favourite books as a youngster though was a copy of Cookery for Children. Despite most of the pictures being coloured drawings, there was something exciting about the idiot-proof step-by-step guide to making chocolate orange cheesecake or egg-in-the-window. I also had copies of Gardening for Children and Modelling (as in craft!) for Children. All three of which were much thumbed. But I never once made anything from any of them. I'm sure the books are probably still stashed away somewhere at my grandparents house, waiting faithfully for me to discover them on that sad day when we'll have to clear the house out. They are most definitely on the list of things that will be being saved. My mother recently bought Abigail a cookery book and I was amazed to see that despite technology having progressed so much and it being far easier to do step-by-step photographs, the pictures are still reassuringly hand drawn. You could almost believe the artist is the same as the style is so similar. It's only the modern recipes that give away the fact that it's not the same book. Leafing through it at the weekend, I came across a recipe for stuffed peppers. As a child, my mother used to have a habit of stuffing anything that found its way into the kitchen and didn't move after five minutes. Of course, chicken and turkeys expect to be stuffed, but she also stuffed rolled pork joints, capsicums, aubergines, marrows and all manner of offal things. The thought of stuffed hearts still turns my stomach to this day. 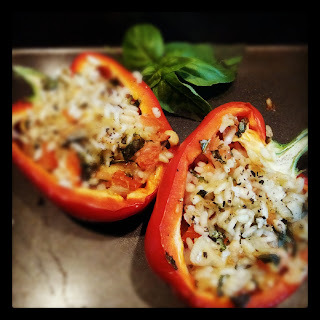 Her stuffed peppers were filled with mince and rice. I have no idea why I refused to eat them (I guess I was a child and it was my prerogative). Instead, I got mince, beans and rice - basically chilli without the chilli and using baked beans instead of kidney beans. She also used to stuff her peppers by slicing the top off, filling the middle and then serving them with the lids back on top, mince peeking provocatively from the top. Even that didn't sell it to me. Much as I'd love Abigail to eat stuffed peppers, I think that day is a long way off in the future. In the meantime, the sentimental side of me couldn't let another children's cookery book go unloved so I decided to make the peppers for my own lunch today. It's not exactly the weather for such fresh, healthsome food. These demand to be eaten outside in the sunshine with a crisp green salad, a glass of wine (not for the children of course!) and some crusty bread. It's a good storecupboard recipe for using up random things from the fridge - I have five more capsicums to do something with before we go on holiday next week. I also added a handful of pine nuts to the recipe for a bit of crunch, but this is one of those very forgiving recipes that you can tweak to your hearts content. I also used arborio rice and think next time, I'd cook the rice in stock (as per adapted recipe below). Can see this working well with chilli con carne (my review of Lorraine Pascale's is the second most popular post on this blog) and loaded with sour cream. Served of course, like my mother made hers with the top serving as a lid, goodies just about ready to spill over the side. Forgot to write down the details of the book, but will update the post with the correct references later. Preheat the oven to 180c/160c fan/350F. Add the stock cube to a pan of water, bring to the boil then cook the risotto rice for 12 minutes. Drain under cold running water to stop it cooking further. While the rice is cooking, heat the oil in a small frying pan over a medium heat and saute the onion for 3-4 minutes until translucent. Add the garlic and cook for a further 1-2 minutes, taking care to not let the garlic burn. Remove from the heat. Place the peppers onto a baking tray. Mix the onions, garlic, rice, tomatoes, cheeses, pine nuts and herbs together. Season to taste. Bake for about 30 minutes or until the pepper shells are soft.